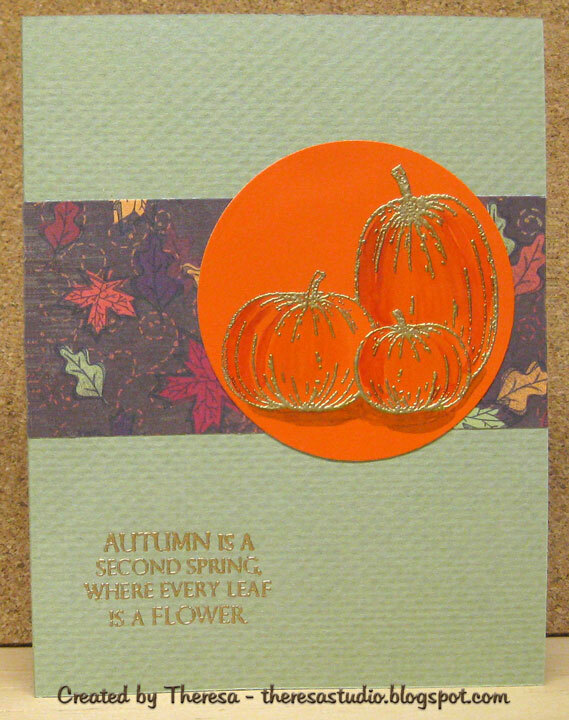 Another pumpkin card using the same pumpkin stamp as the first one I posted today but I stamped it on a paint chip card from the hardware store. The paint department has great inspiration for colors and combos to use. Have you ever used paint chips in card making? If you have ever collected some of these when selecting colors for painting projects, save them to use in card making. Was just playing around to see how I could re use some paint swatches I picked up the other day....this one is Glidden's Fresh Tangerine. When I stamped it, the ink would not dry so I added some gold EP and heated it to get this look. Then added some coloring with Copics which did dry very quickly. Cut out the pumpkins and made this simple card. Tip: Ask your local hardware store what they do with discarded color samples. Maybe they will save for you. One of my very favorite flowers for fall is mums because of all the beautiful colors available. 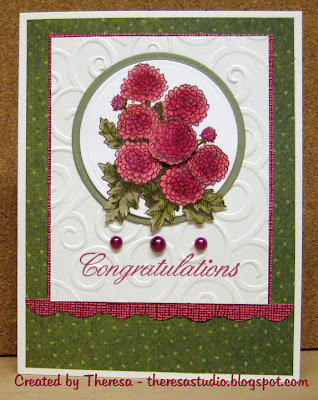 I just love this mum stamp from Flourishes and love how detailed it is. I made this card for Timeless Tuesday challenge and sketch challenge for Annabelle's Stamps. I began with ivory CS for the base with a mat of green pattern paper. Cut another ivory mat which I embossed and placed on a red textured CS mat with a scallop border. 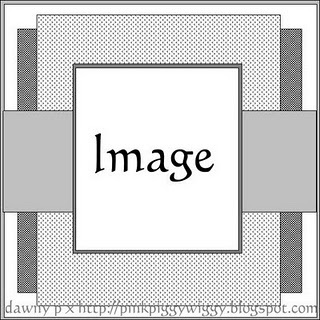 My focus image was stamped and colored with Copics and cut with a circle die with leaves extending beyond the circle. Restamped and cut out the center flower and popped up for dimension. Also added flower soft to the 2 buds which I hope shows in the photo. Finished with pearls and a stamped sentiment. Thanks for dropping by for my fall mums. There seem to be a lot of autumn/fall challenges both in theme and colors as well as vintage challenges. I have combined several of these challenges and came up with this card. I started by downloading this lovely vintage image from Create at TLC "Preparing the Pumpkin" ...Thanks to Paulette who has so many lovely images that she shares with us. I colored the image with Copics trying to stay with "vintagey" colors almost faded looking. 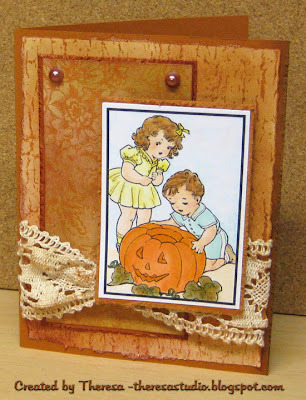 I matted this on a pumpkin spice CS on which I distressed the edges as I did on all the mats. Used the same color as the base card. On the bottom mat I stamped a crackled look with distress ink. I used a pattern paper that I also distressed with ink....almost too much since I almost lost the pattern...hope you can see the floral pattern. This went atop another mat of pumpkin spice. Found this very old lace in my collection and wrapped around in a twist...did not need much distressing since it already had that vintage look. Added the copper pearls and used pop up dots to raise the image above the lace. Speedy the Cat's Friends Challenges: Use a pumpkin on your card. 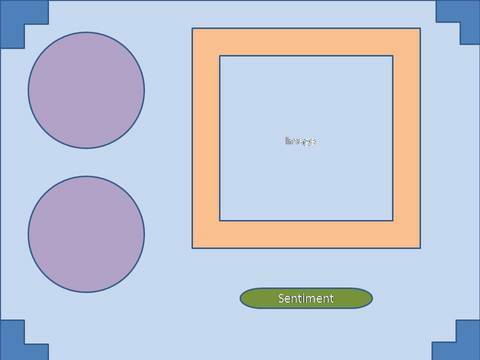 City Crafter Challenge: Use sketch shown on right. 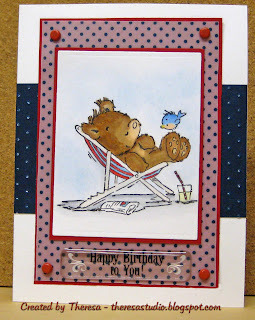 Beary Sweet Challenges: Go vintage. Stamp Something: Use fall colors. Going Grey with Scrap Creations Challenge: Theme is fall. Alphabet Challenge: V is for vintage. It has been awhile since I used a digital image from Phindy's Place so I printed this one out of Petticoat Patty, such a sweet girl. 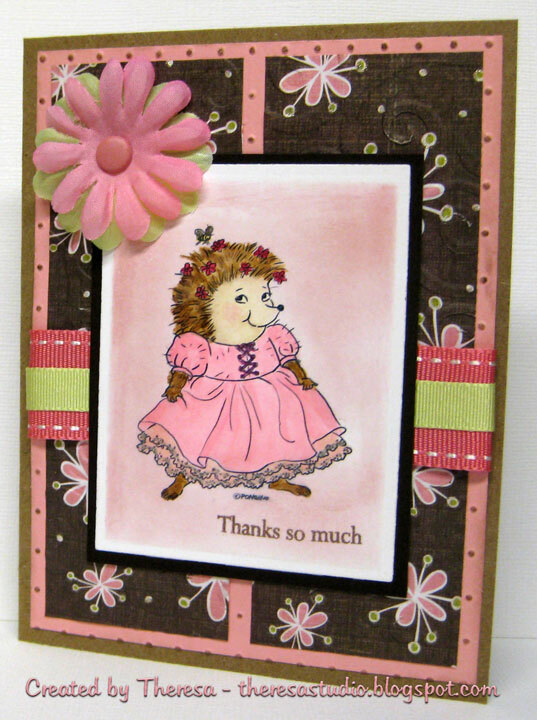 I colored her in pretty pink and gave a sponging of pink and stamped a sentiment on the image before matting in brown. 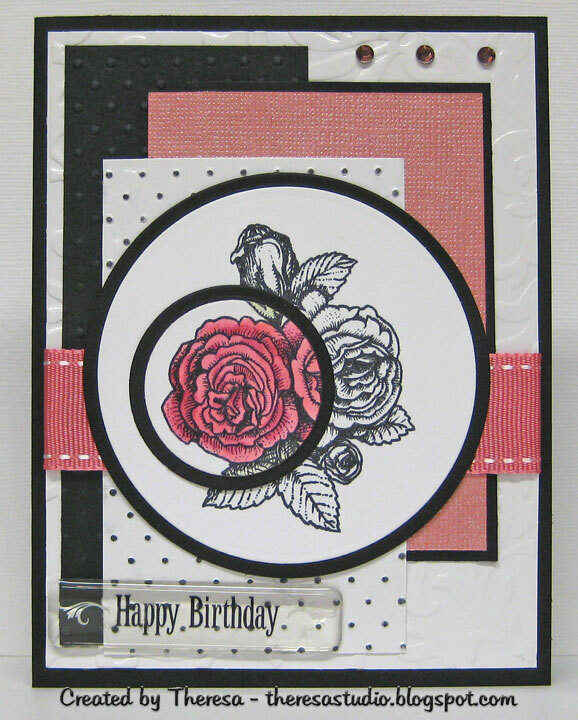 Using a great sketch from Friday Sketchers, I used a kraft base card with a mat of pink that I embossed and highlighted the dots with ink. I then added some brown pattern paper with design in pink and green (embossed too but hard to see). Attached a pink ribbon that I layered with a green one and added a flower of the 2 colors with a brad for the center. I think Petticoat Patty looks "right smart" atop the card. Finished with a little glitter on her petticoat and the bee above her head and on the pattern paper. Phindy's Place Challenge: Make a thank you card. Digital Tuesday Challenge: It's all about the girls. 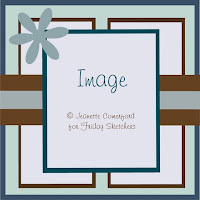 Digi Doodle Shop: Use some kind of embossing. Image: Phindy's Place "Petticoat Patty"
I made this card for Sentimental Sunday challenge using the sketch challenge from Kaboodle Doodles and color challenge for Saturday Challenge at Secret Crafters. This is first time to entered the last two challenges mentioned. 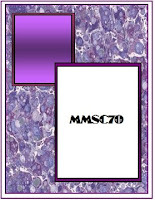 I used silver metallic CS that I embossed ...I first tried cs without embossing and it was boring but the texture brought it to life... and added cut outs of purple for the corners that I cut using a nesties. 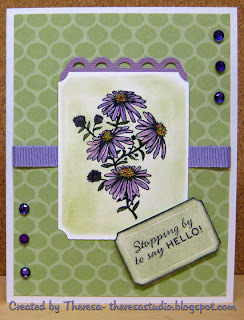 Used 3 different sentiments stamps inked with purple and cut 2 with circle nesties and one I cut freehand. I edged these with silver pen and sponged lightly with purple. My image is one I printed with PrintShop software. I left the wedding couple in black and white , colored the rose with purple glitter pen and also sponged the edge with purple ink. Matted this on purple paper. Assembled card following sketch. 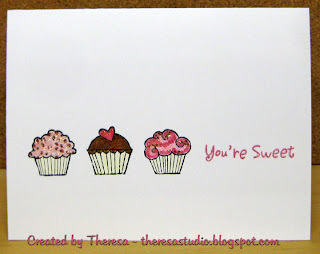 Thanks to Jessica Lynn for the stamps that I won in her blog candy. 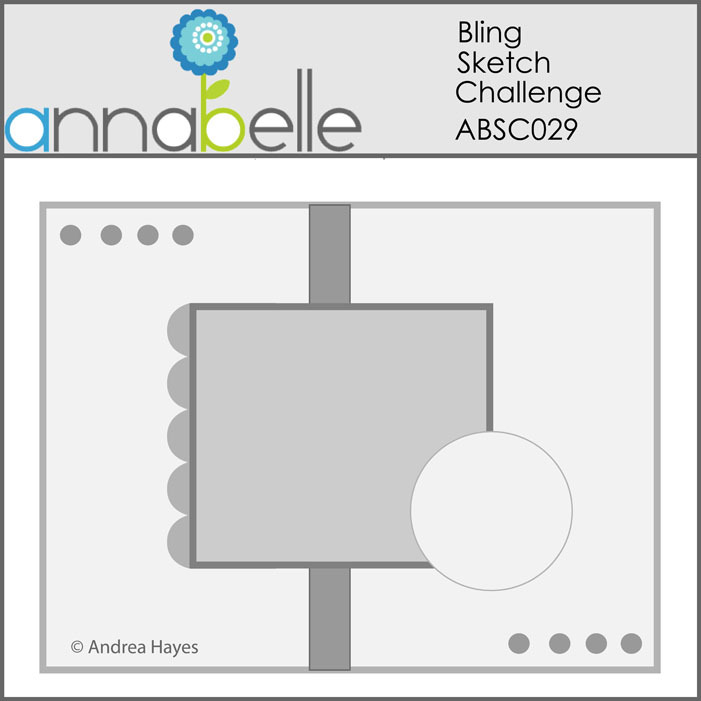 The challenge at Basic Grey Challenges is a wonderful sketch by Tara G shown to the right. I had started out trying to use some Basic Grey paper but it did not look right so I changed. One of the requirements for this challenge is to use a Basic Grey product so I used Basic Grey Cappella brads on the center of the flowers. 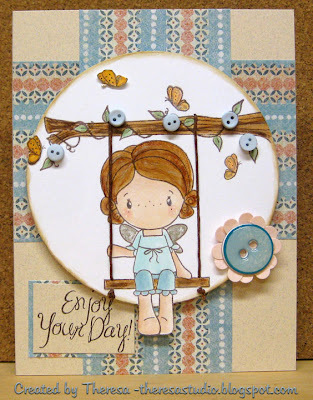 I chose to use Browns and Tans plus some cream to meet the color challenges at Joan's Gardens, Critter Sketch and PaperPlay. I followed the layout using a brown floral paper which I colored in the flowers tan to give better contrast and to match the image flower. The image was stamped on cream CS, colored with Copics, cut with circle die and layered on 2 more circles. 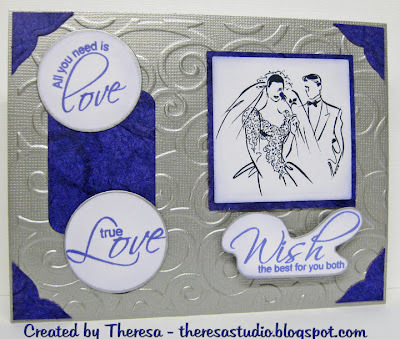 I used a striped paper, a dot paper and a solid cream that I dry embossed. 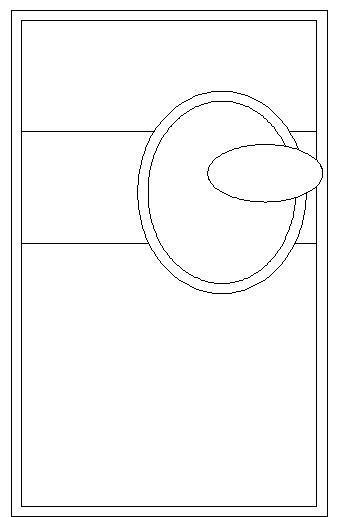 Instead of using a punch for the border shown in the layout, I trimmed a diamond print pattern paper to use as a zigzag border. Actually used 7 different papers in total. Assembled all on cream base CS and added buttons to the embossed strip. Critter Sketch Challenge: No Color-use only use neutral colors- tans, beige, brown, cream and so forth. 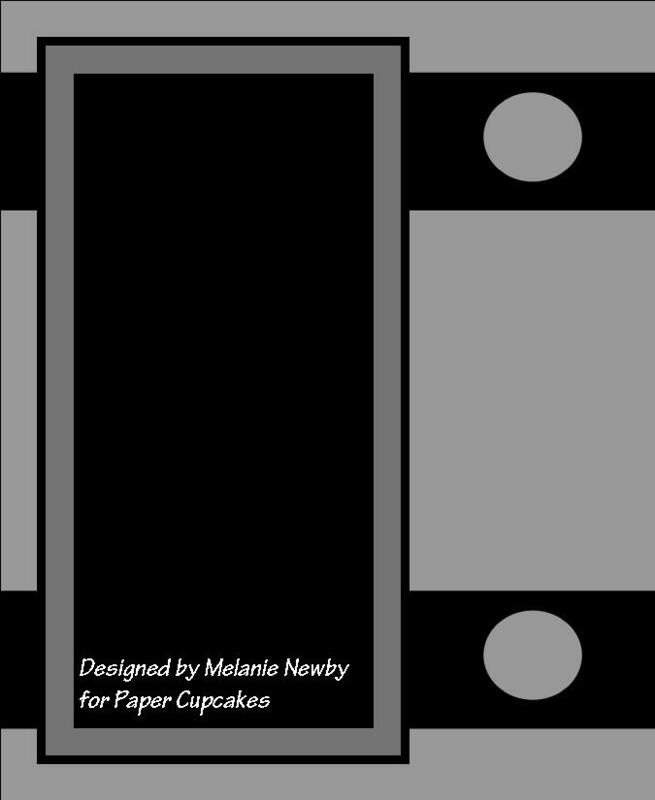 PaperPlay Challenges: Theme is Coffee and Cream. Use only shades of brown on your creation. 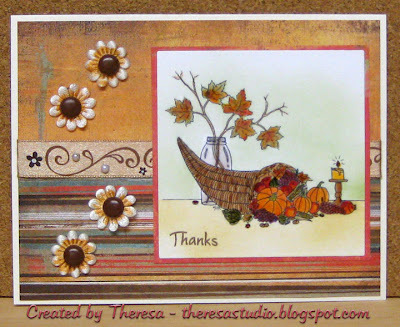 Joan's Garden Challenge: Make a card or project and use the following: Color - Brown and Tan, Embellishment - Buttons, 3 Layers (preferably Nesties), and Fall Flower. Stamp: GKD Lily "A Year of Flowers"
Buttons: Lansing Brown Pearl Buttons ...these were some very old buttons still on an aged card in my collection. That's how I knew the manufacturer. When I googled the buttons, I found they are vintage. I should have kept intact since they are collector item??? My card is brown although it may look black in the photo. 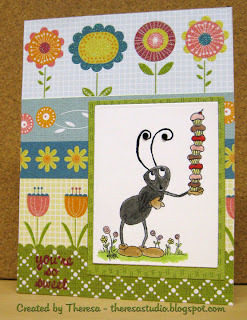 I seldom make a card with no color but it turned out OK.
Sue W said... This is stunning Theresa! Love your layout and colouring the dp was a great idea! Good luck with the challenges. It turned out much better than o.k.....I love all the texture and patterns together. The browns are beautiful. I love monochromatic cards and especially this one. This is amazing... totally love the color scheme! 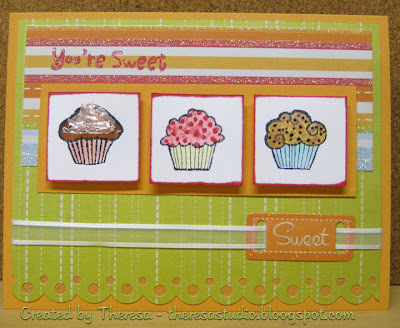 At There's Magic in the Air, my friend Patti N. brings us this weeks challenge and she wants us to use the freebie "Easy Does It" by Paper Cupcakes and add some bling to your project. 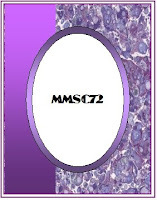 Go to the link to download the freebie. Such a cute image! I printed it out and colored with Copics and added Matte Accents to the ant and cupcakes. I placed some Black Gems from Hero Arts to his attenae for bling. 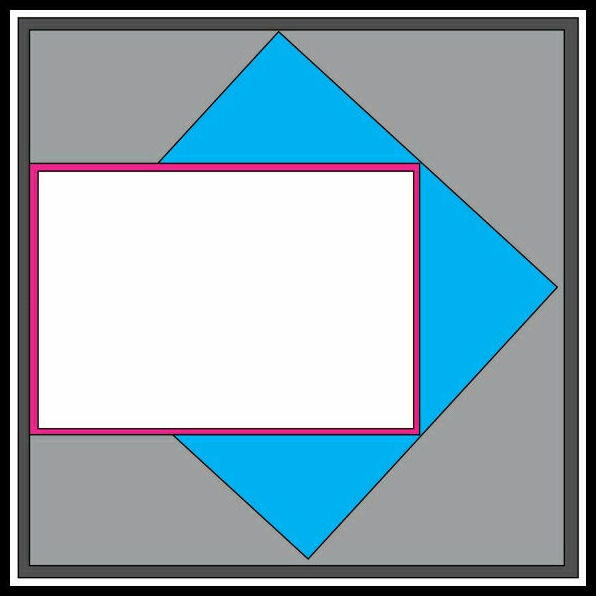 Matted this on a green cs and did my layout following the sketch from Card Positioning Systems shown to the right. Used papers from DCWV Spring Pad. Finished with sentiment from Studio G Clear Stamps. That was "easy peasy" to quote Patti. James Bear Sledding or Sledging. This is my second post for the day. 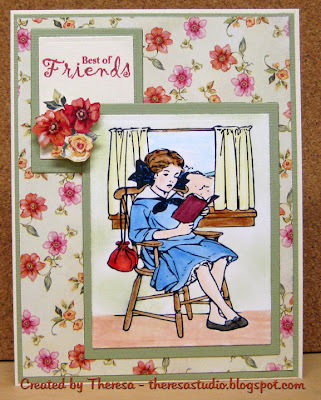 I have made this card for many challenges but mainly for Lili of the Valley since I am using their sketch and stamp. Love this bear James as he is sledding down the hill. I can use this for a winter birthday for a boy or even a Christmas card. 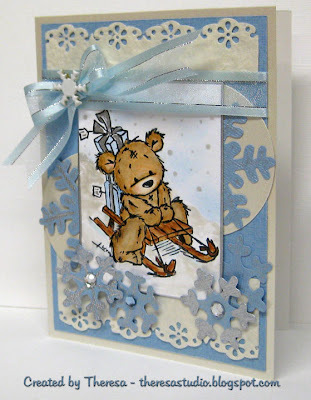 I stamped the image with black ink and colored with Copics, sponged the sky blue, and added stickles for snow and some dots of stickles for snowfall. I am not happy with how the stickles and silver on bows photographed but trust me it looks good in real life. I cut out image with Nesties rectangle die and edged the image with silver. Used a Base Card of Oyster pearl matted with blue. Used hand made paper in cream that I punched with a lace design. Added some circles cut with dies and layered with punched snowflakes and more snowflakes decorated with rhinestones, glitter pens, and silver pen. Finished with ribbon and bow topped with metal snowflake. Just Cute Bears Challenge: Punch it. All Sorts: Use at least punches. 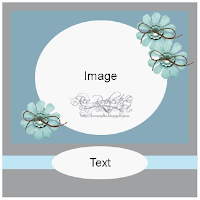 Wild Orchid Challenge: Use ribbon and bow. add a little metal, and make it something sweet. Lollipop Crafts: It's a Boy thing. Thanks for stopping by. Have a nice visit. Surprised with the End Result! 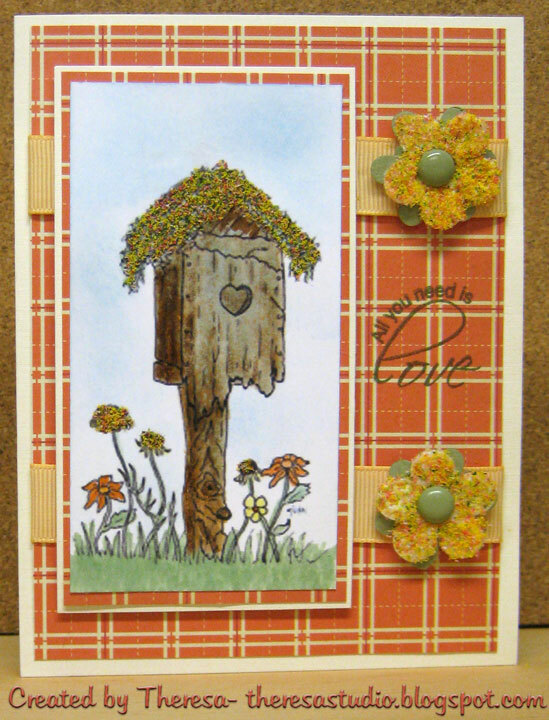 I made this card for Joan's Garden Challenge and the Midnight Madness Sketch challenge. I am so glad Joan did not require us to use a stamp because I did not use one...had planned to use a stamp but my paper choice inspired me to go another direction. I found this pattern paper in my stash with all the right colors, added the orange pattern that I dry embossed, and used another dotted paper for the mat under the oval cut out of the flower. 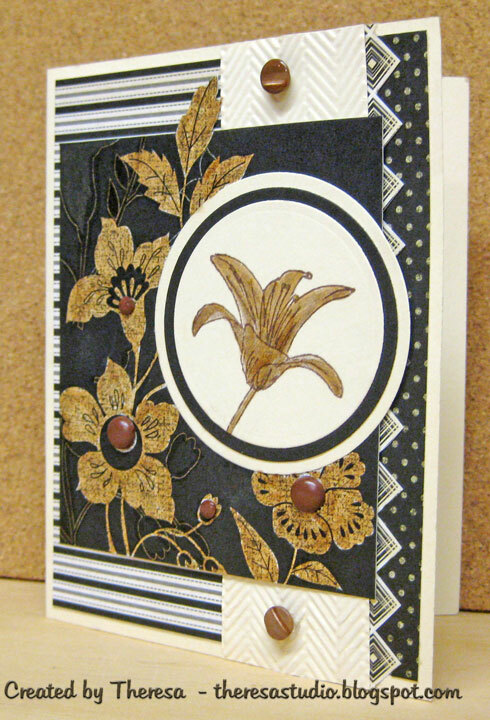 I did use distress ink around the edges of the base card and pattern paper mats. I assembled the card using ivory base card and a mat of pumpkin spice following the sketch (see on the right) to place the pattern papers. Added the printed ribbon and my hanging embellishment. For that, I wired together some heart shaped beads, floral beads, an ivory bead, and a larger bead from an old hat. I attached it with a green brad. Added one more bead to upper right corner. 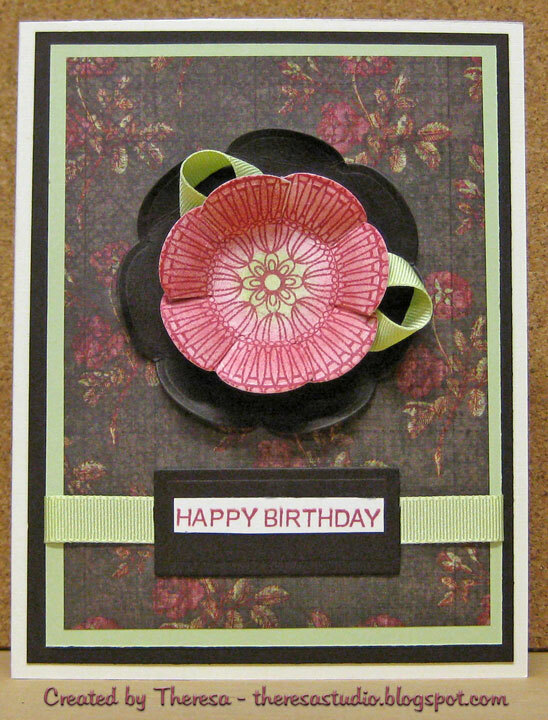 After I had finished the card, I had one more idea.....cut out another flower that I used as my focus. I shaped the petals for dimension and glued some orange beads to the center. Attached the flower with pop ups ....this was a great finish. Love how the card turned out ...better than I expected when I started the challenge. This is a card that seemed to evolve on its own once I found the right paper. I received this Swiss Pixie stamp in some blog candy and have been wanting to ink it up so here it is. I stamped it in brown and colored with Copics and added sparkle to the fairy wings and butterflies. 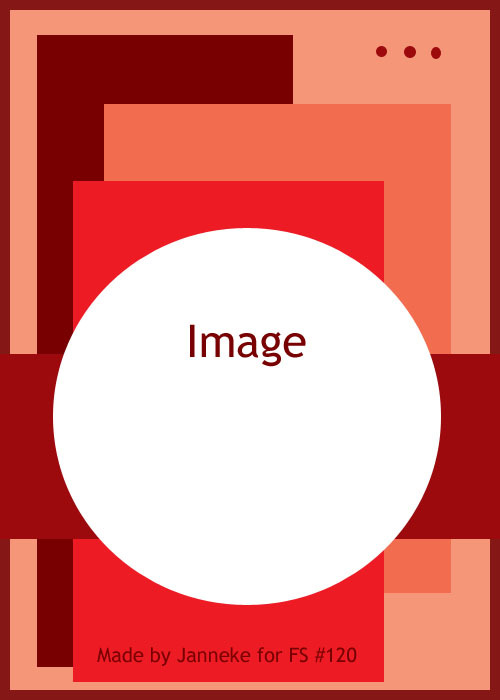 I cut out the image and distressed the edge of the circle. I let Nora's feet dangle beyond the bottom..looks like she is actually swinging. I added some flowers to the vine using mini buttons. 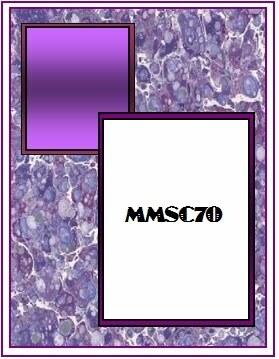 On the base card of a speckled CS, I added the pattern paper strips....used this paper because it picked up the colors on the image. I stamped and cut out more of the butterflies and attached with glue dots. I used brown twine to give dimension to the swing. Don't know if you can see in photo. Added another button layered with punched flowers. Finished with a sentiment. Flutter by Wednesdays: Create a creation using buttons! Include a butterfly, fairy or angel. 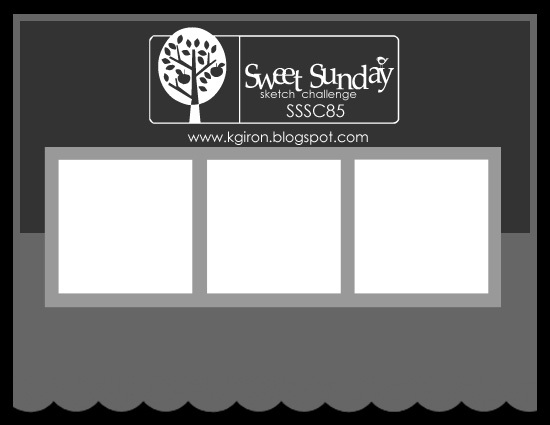 Sweet Sunday Sketch: Sketch on right. Cute Card Tuesday: Have a bird or butterfly on your card. Can be the main feature or an embellishment...your choice. 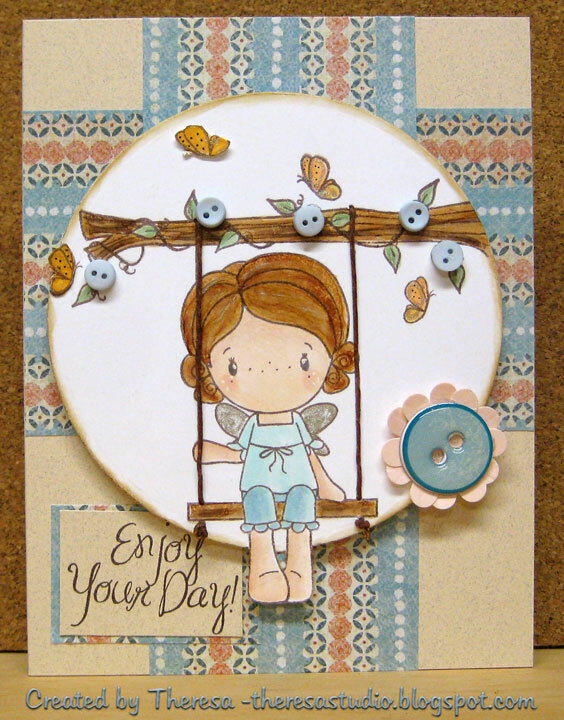 Stamps: Swiss Pixie "Nora on a Swing"
This week's One Layer Wednesday Challenge from Susan is to use three images plus one sentiment. Made this simple card using Studio G stamps that I stamped with Memento Tuxedo Black on GKD PL White CS and colored with Copics. Added Gary's Crystal Glitter that picks up whatever color it covers. Stamped the sentiment in Memento Rhubarb Stalk and used glitter pen to outline. What a sweet and easy card. Thanks for dropping by...help yourself to a cupcake. May have to "Bake" up some more of these sweets. 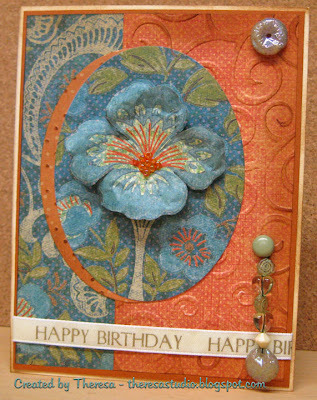 For this card I used a sketch challenge from Limelight Papercraft with a focus on tags. 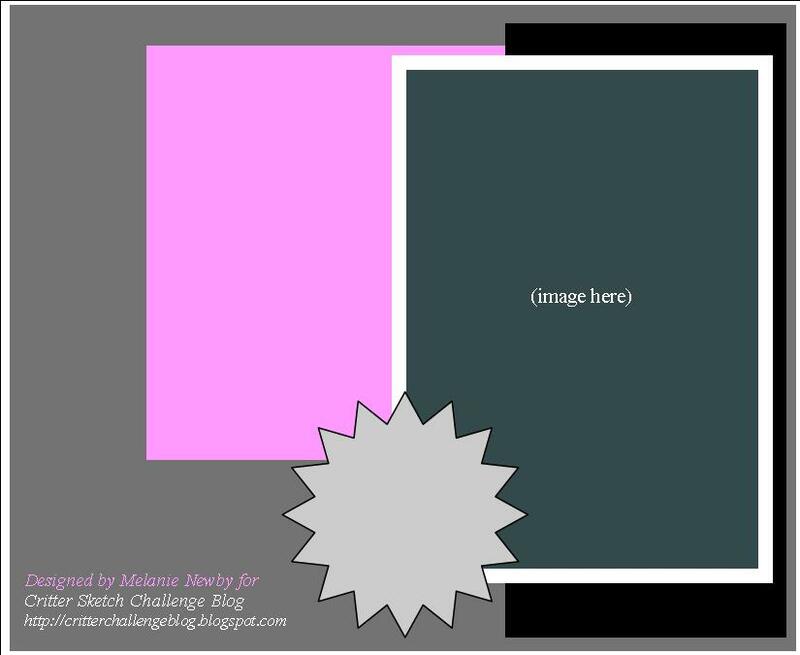 I started with a digi image from Create with TLC that was a freebie from Paulette. I am using the giraffes to tie in with a challenge from Really Reasonable Ribbon. I colored the image with Copics...what a job with all those spots....and sponged the background with blue and green. Found some pattern paper in stash that reminded me of Africa .. cut a strip for the edge with decorative scissors with a crocodile pattern...appropriate for the jungle theme. 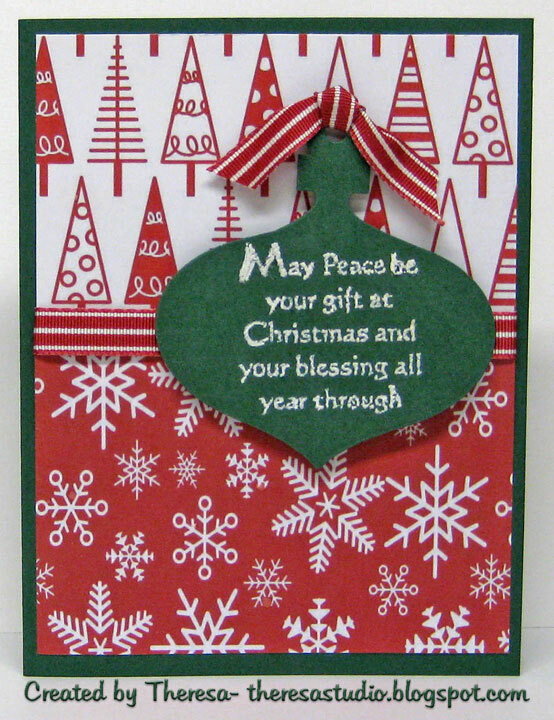 Assembled card on solid CS for base and added a ribbon that I thought was perfect for the colors....kept it simple with the lines of the card. Punched tag out of the pattern paper and added a rub on sentiment. Tied on with twine. 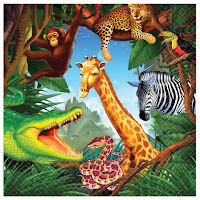 Really Reasonable Ribbons: Create a project inspired by the picture of the jungle shown. 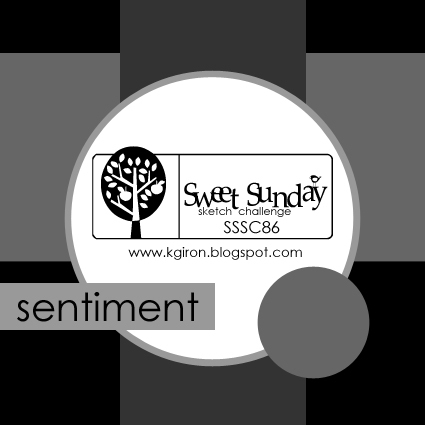 Lollipop Crafts: All about family...this digi is about family. 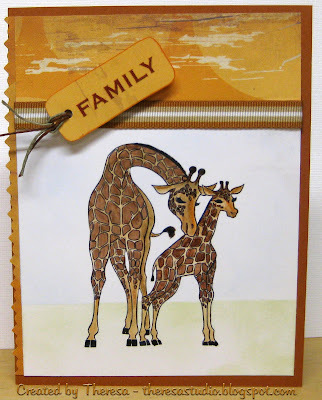 Digital Image: Create with TLC "Giraffe Vintage"
This was a fun challenge card to put together! 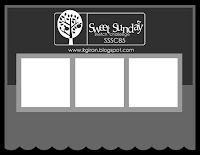 Sweet Sunday Sketch Challenge is to make a card with this layout. The extra challenge this week is to create a birthday card and mail it to Operation Write Home. 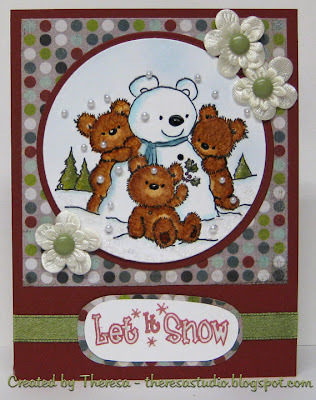 I made this card for the sketch challenge but will have to make another to send to OWH....was not thinking when I used the glitter...oops! ...so will not qualify for the extra challenge. I send cards to OWH so I know better than to use Glitter. 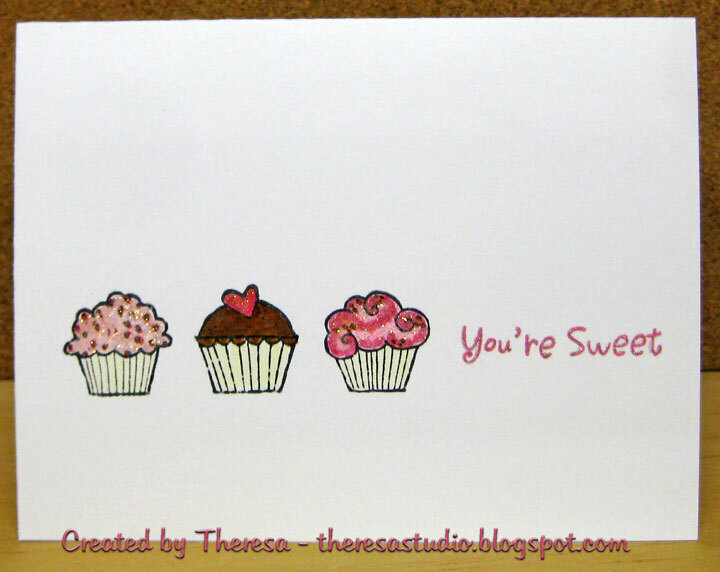 Stamped cupcakes, colored with Copics and added Stickles to the icing. Popped up the cupcake squares with dimensionals. Added ribbon with the cutout sentiment. Used glitter pen to highlight sentiments and punched holes. 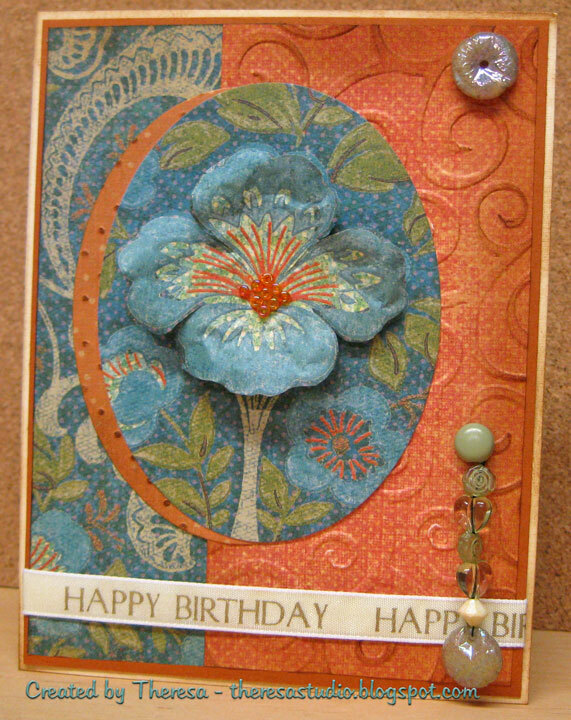 ﻿I made this card originally for Flourishes Timeless Tuesday challenge to use a ticket on the project that was last week but I never posted it. Will still enter for their monthly drawing. I stamped the Aster image and colored with Copics and sponged while in the nesties die. Made my ticket by cutting with a nesties but resized smaller than the die I used. The paper is from some blog candy....added lavendar ribbon and scallop border and some purple bling to finish. Used layout sketch from Annabelle. 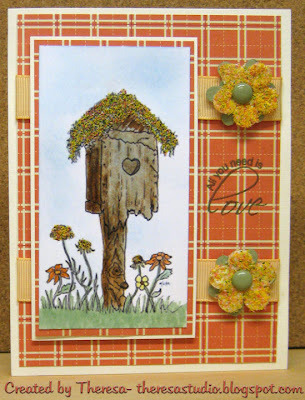 The Shabby Tea Room: Create a card or project inspired by nature and/or using green. Love the color and design of this fresh green pattern paper. Sorry I do not know the source. I had printed out this digi of a car from Meljens and had planned to use in one of her challenge but never did. The theme challenge for Cards for Men this week is transport so I colored the digi with Copics and added Glossy Accents to the windows and headlight and Matte Accents to the tires. 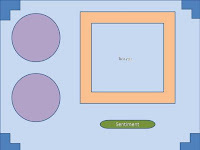 Used the Friday Sketchers sketch for layout. Used striped paper as mats and a square of Orange that I embossed with Swiss Dots. Assembled on a base of ivory CS and added rub on sentiments. 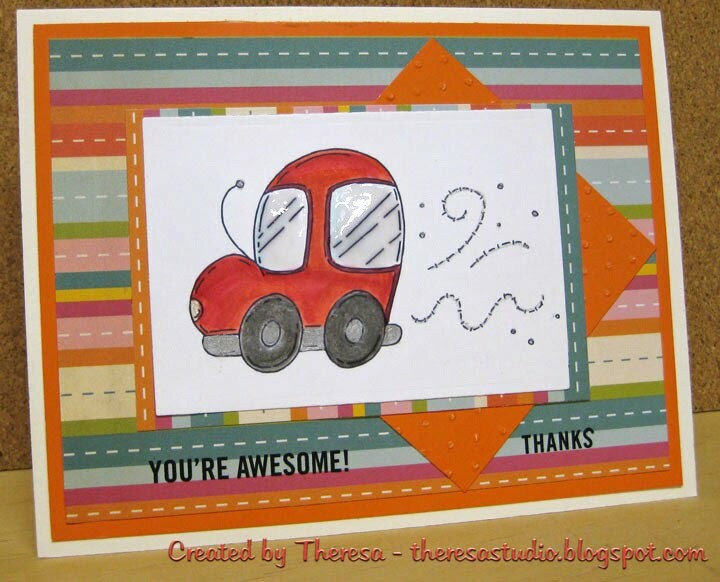 Cards for Men: Theme is "Transport"
Craftalicious Challenges: Theme is "Thanks"
Image: Meljens Designs "Vroom, Vroom"
Hope you are up and away to good times today! 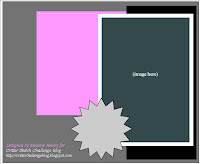 Simplicity's One Layer Challenge this week is to make a black and white card with just a single spot of color. 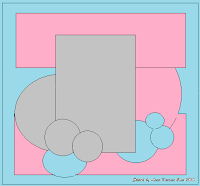 Just keep the spot of color rather smallish, so it stands out all the more! This bear stamp was sitting on my counter and said "Use me!" So that I did. Stamped in black ink on folded white card. Colored in the balloon with red copic and added Glossy Accent ....can you see in the photo? Added the birthday sentiment and I am done. For Fun Challenges: Color challenge-use black and white plus one other color. 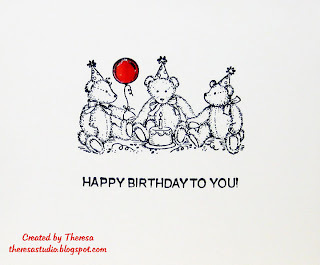 Stamps: SU "Birthday Bears" and GKD "Candles on the Cake"
Many times when I make a card I select the DP first and paint a image to go with the colors of the paper. This time I colored the image and then selected the paper.... I believe this paper is a perfect match to my image...not only the colors but love the vintage look of the floral print with the vintage image of the girl reading by the window. She looks to be from the late 1800's or early 1900's by the way she is dressed. I love her sailor dress with the petticoat and her accessories. I imagine she is on a summer holiday at the beach and loves to read...her books are her friends when she is away from home and friends. Over her shoulder you can see the beach. 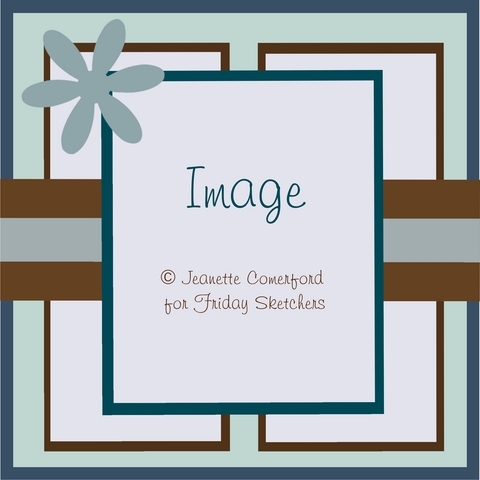 This vintage image is a freebie digital from Paulette from Create with TLC. Love her great digital images. I colored with Copics and sponged the wall background. I cut the image and green mats with nesties and assembled card using a sketch from Midnight Madness. Added some flowers that I cut out on the reverse side of DP with pop ups. 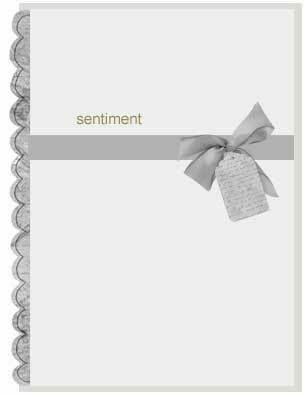 I think the sentiment is a nice finish for the card. Creatalicious Challenges: Vintage- I used vintage image. Stamps: Create with TLC Digital Image "School Time Vintage"
Mark's Finest Papers Sentiment "Thankful Mums and Pumpkin"
3 DP from Basic Grey "Max and Whiskers" ( mat under the image is a DP but hardly shows), 2 Pearls on the ribbon, and 1 ribbon. Colored the image with Copics and used Glossy Accents on the jar that looks better in real life. 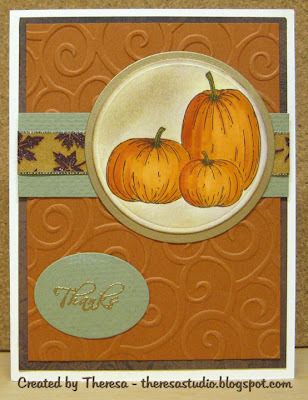 Sentiment is from Mark's Finest Papers stamp set "Thankful Mums and Pumpkins". 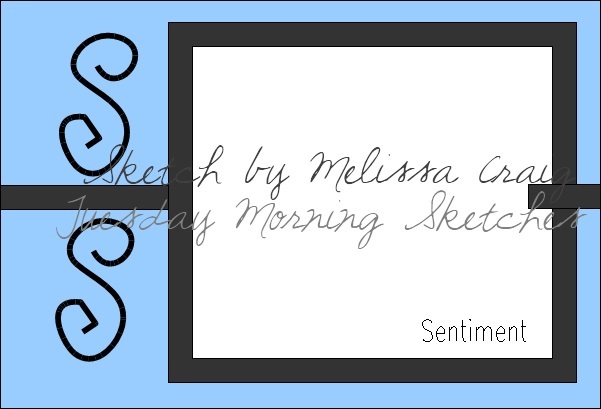 Used the sketch from Tuesday Morning Sketches by Melissa ...will enter in their challenge too. 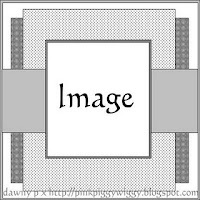 This week the Basic Grey challenge is to use some Paper Piecing on your creations. I like to do paper piecing especially on quilt cards because my Mother is a quilter and she likes to receive my cards with quilts...quess she always wanted me to take up that craft. I took my color inspiration from a pattern paper from Basic Grey paper pad "Olivia". This paper just looks like a fabric to use on a quit. I stamped the quilt on pink CS and the pattern paper and then did the piecing and colored in the pinwheel design with copics. 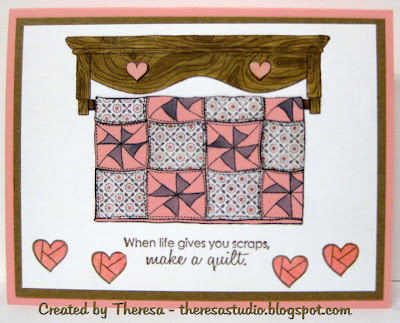 Stamped the Quilt hanger on white CS and colored with copics. Paper pieced the hearts on the wood. Hung the quilt and added hearts and sentiments. Layered on Kraft CS and then onto the base card of pink. Today feels very fall like with temps in the 50's this morning.. Summer has gone by so quickly and winter is not far away so it is time to enjoy the beauty of fall . I used these fall stamps from Mark's Finest Papers to create a card for the coming season. 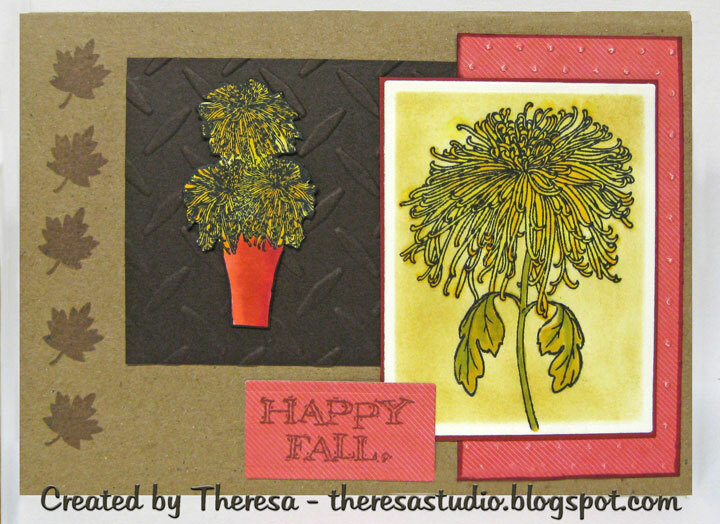 Stamped the large mum and colored with copics and sponged with yellow after cutting with a die. Stamped the pot of mums and colored in the same way but cut out to mount on the brown mat embossed with Cuttlebug. Also embossed the red mat that I placed under the larger mum. Assembled the card adding 5 leaves and sentiment to complete. 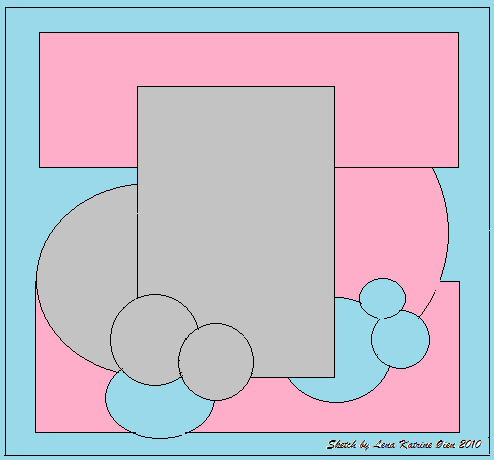 Followed the sketch shown on the right. Speedy the Cat's Friends Challenge: Use 5 of something on project. 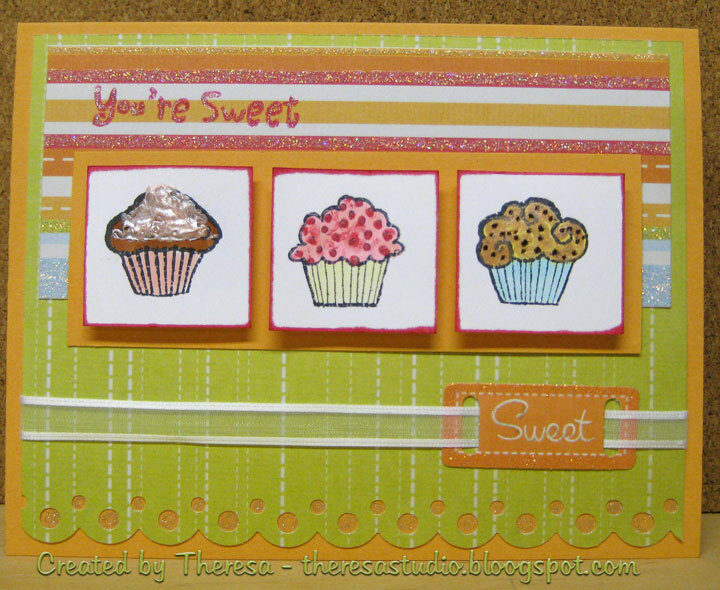 Stamp TV Color Challenge: Use Kraft, Red, Yellow, Brown, and One Neutral color(optional). PaperPlay Challenges: Autumn is coming. 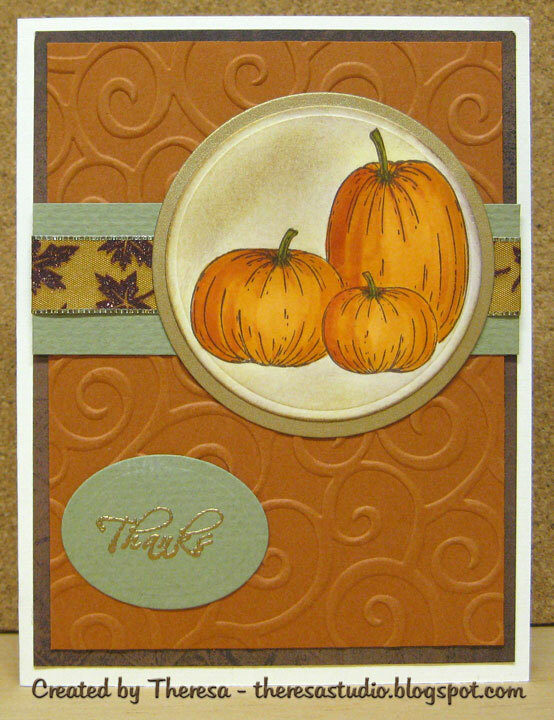 Stamps: Mark's Finest Papers "Thankful Mums and Pumpkins"
Another new fun stamp From Lili of the Valley. 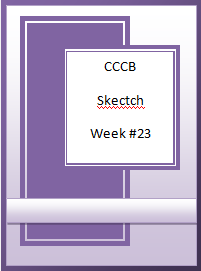 Since I really liked the sketch from this week's LOTV challenge I am using it again for a card to enter at Just Cute Bears Challenge and Simon Says Stamp Challenge as well as LOTV. Colored the image with Copics, sponged the sky with blue, and added some stickles to the snow and snowman. Cut image with circle die and matted on circle of cranberry. 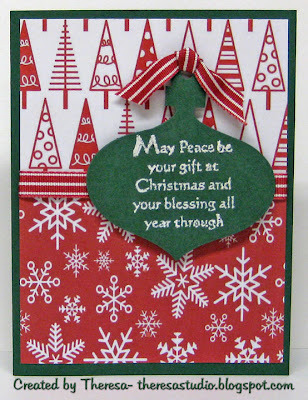 Used a mat of Basic Grey Pattern Paper and placed on the base of cranberry. Finished card with ribbon, matted sentiment, flowers with green brads and snow fall of pearls. Just Cute Bears Challenge: Go Dotty. Simon Says Stamp: Theme is Holiday Fun. 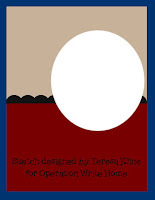 LOTV Challenge: Use Bev's Sketch and LOTV image. Creative Clear Stamp "Let Let It Snow"
This card will be great to duplicate for Christmas cards.